Pattaya School of Languages and Computers is the official school name and is the location of the head office. The school name is often represented as PLC, PLC School, or PLC School and Training Centre. These titles present the school as a whole entity (PLC, NPLC, and the Training Centre combined). The school and training department are licensed by the Thai Ministry of Education, and each entity follows the required guidelines and criteria. PLC School prides itself on maintaining high standards and has been certified to ISO standards by The Private Education Commission. Pattaya School of Languages and Computers is a private school. The student profile features mostly adult learners - primarily Thai and foreign students from the U.S.A., Australia, the United kingdom and European countries. There are also students from Russia, China, Korea, and Japan. PLC provides tuition or full English language courses as extra after-school studies for young Thai learners. There is no full-time curriculum for children. All courses include a skills focus and follow a set syllabus. Language courses are supported by professional course books and materials from well-known publishers. Additional or specific materials are developed and tested by the PLC training department. All courses are revised at regular intervals to ensure the most effective materials and teaching methods or options are provided. 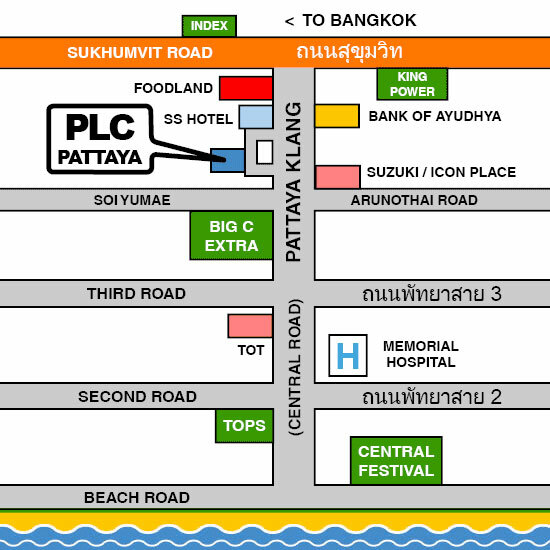 Situated in central Pattaya, this branch occupies a large mutli-storey building. The reception area, training center, classrooms, and the school canteen are situated on the ground floor. Further classrooms and facilites are situated on each of the floors above. Head office and main administration are also located at this branch. The full range of courses and education visas are available. The training centre is a department within Pattaya School of Languages and Computers (PLC). The centre consists of two large, fully equipped training rooms. The training centre carries a license issued by the Thai Ministry of Education for the training of students for a TEFL certificate (Teaching English as a Foreign Language). Other activities include PLC teacher training, publishing, and the development of courses and materials. All PLC School classrooms and training rooms are fully equipped and air-conditioned. The school is conveniently situated on a main road (Pattaya Klang) and has parking facilities. Main shopping centres and accommodation can be found in and around the local area. This is especially useful for those who intend to travel from abroad to stay and study. Level placement, course books and materials follow CEFR guidelines. Language courses include the study of grammar, vocabulary, and pronunciation. The primary aim of the general language courses is to develop language skills (listening, speaking, reading and writing). Levels progress from beginner to advanced level. Vocabulary and conversation courses aim to provide fast acquisition of new language through vocabulary and model language. The materials and teaching methods are designed to help those who are learning a local language (learning Thai in Thailand for example). Having an overview of common language and expressions can help with communication in daily life. Computer courses are general and cover three main areas: computer skills, applications, internet and online media. Certificates issued are records of study time and the subject (or subjects) studied. In some cases, the student may be referred to further certified training from third parties. In this case, the student learns online and is certified directly by the course provider. This may be with teacher guidance at PLC School, or through independent self-study at home. If you require a specific I.T. qualification, or wish to confirm the validity of the certificates issued by PLC School with your employer, please contact us. PLC School can support an application for an education visa for foreign students for selected courses. However, this is not the full responsibility of the school. The Thai Immigration Bureau, local embassies and the applicant themselves are all involved in the application process and the subsequent maintenance of the visa. If you are currently in your home country and would like to travel to Thailand to study, PLC School can help and advise on the best way forward and the options open to you in terms of study, daily living, and accommodation once you are in Thailand. An education visa can give you a period of six months, a year, or the option to renew and continue year by year - depending on what you want to study. Exam preparation is available at PLC School. Exams and certification are provided by official test centres and providers (Cambridge KET for example). Preparation and practice are available for the following examinations: IELTS, TOEIC, TOEFL, KET, PET, FCE, and BEC. The final examination is taken with an official provider, and are not provided or certified by PLC School in this case. A full guide is on this website. PLC Official Certification: Courses carrying certification from PLC School are in accordance with the Thai Ministry of Education and follow specific outlines and criteria. Courses include Thai language courses and Teaching English as a Foreign Language (TEFL). A TEFL qualification is recognized worldwide and is verified by PLC School. Internal certification for PLC courses provides records of study hours for both language and computer courses. These attendance certificates are verified by PLC School, but are not officially recognized as credits, as a qualification for further education, or as part of an application for a teacher's license. Culture courses are full courses developed by PLC School. However, they are not official courses, and are not recognized as a part of an application for a teacher's license.